Debenhams is the leading department store in Ireland, featuring a unique range of both international designer brands and exclusive own-brands. Great sales and offers, in-store events, and excellent customer service are standard in Debenhams, where a relaxed store atmosphere can always be found. Debenhams departments include Men's and Women's Fashion, Kids' Clothing, Home, Electricals, Wedding, Beauty and Gifts & Toys. Stores are located in Dublin, Cork, Galway, Limerick, Newbridge, Tralee and Waterford. How it Works: Use this gift voucher on AllGifts.ie to order eGift Cards for use in any Debenhams store in the Republic of Ireland, and on or on debenhams.ie. Or you can swap this voucher for any other gift or voucher listed on AllGifts.ie. Debenhams eGift Cards are sent by email once ordered, normally within 3 working days. 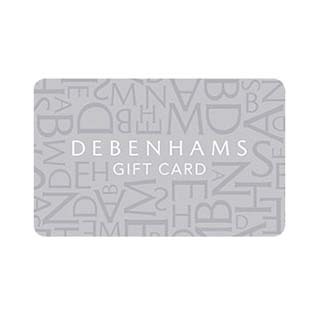 Debenhams Ireland vouchers are available in denominations of €10, €25 and €50 (e.g. €10, €20, €25, €30, €50, €100 etc). Minimum voucher value is €10. Great sales and offers, in-store events, and excellent customer service are standard in Debenhams, where a relaxed store atmosphere can always be found. Debenhams departments include Men's and Women's Fashion, Kids' Clothing, Home, Electricals, Wedding, Beauty and Gifts & Toys. Stores are located in Dublin, Cork, Galway, Limerick, Newbridge, Tralee and Waterford. Debenhams Ireland eGift Cards are sent by email, normally within 3 working days.